© 2005 Daniel Lozada Guzmán. All rights reserved. More pop than timba, Danny's impeccable voice graces different tropical styles -balada, cha-cha, son, salsa, flamenco, popular- and proves he can do it all. Though not the straight-up timba we would expect from this ex-Chanraguero, this record provides a spectacular outlet for Danny's other vocal styles and abilities. Lest we forget that he writes all the music, his impeccable voice really lends itself to black soul and R&B sounds made popular in the US. The influences are undeniable. Also at ease with NY-style salsa, Danny swings on the dance tunes and graces us with the ballads, both modern and traditional. If you already own 'Tanto Le Pedi' and enjoy the new sounds of Bachata, 'Lo Mejor De Mi Corazon' is a great addtion to your Lozada collection. 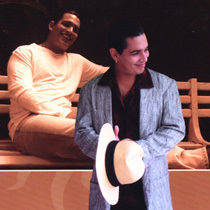 After 1999, Danny played sporadically in Havana and made another album, "Lo Mejor De Mi Corazón", which was a mixture of some timba and various forms of pop. In 2005 he moved to Miami, and in 2007 played his first West Coast tour, which was documented in great detail on TIMBA.com. His performing and bandleading abilities are second to none and seeing him in concert is a must for any red-blooded timbero!